Being that the kitchen is the gathering place and the most visited room in your home, it is of the highest importance that you spend time planning for the best possible lighting so that your kitchen looks and functions it’s very best. Your kitchen should be a layered mix of light consisting of task lighting, ambient lighting, accent/decorative lighting, and natural light. When beginning the design of your home remodeling project, it is always best to plan ahead by considering your kitchen space, layout, design and overall theme. • Task Lighting: Being the pillar of illumination, task lighting provides sufficient light for food preparation over countertops/sinks/island, as well as reading recipes and organizing. Ideal placement of task lighting would be located between one’s eye level and the work surface– making lighting located below the upper cabinets most effective. • Ambient Lighting: This layer of light gives off a warm welcoming radiance, filling the room with light and softening shadows. A great spot for ambient lighting is above cabinets, should there be space between this area and the ceiling. • Accent & Decorative Lighting: A kitchen design that includes accent lighting will gives off more depth and dimension, making your kitchen truly stand out from others. Examples of accent/decorative lighting would be fixtures placed inside glass-front cabinets to illuminate your fine china and glassware—adding sparkle to your entire kitchen. Another area for accent & decorative lighting is under your cabinetry– as well as toe tick lighting that give off a warm glow under floor cabinetry as well as your kitchen island. For a warm evening welcome, think about connecting to a motion sensor to light the way back for those late-night snacks. • Natural Light: Nothing can compare to natural lighting, and you will want to make sure you have plenty of it in your kitchen. Plan your natural lighting design before adding other layers and the end-result will be a success! 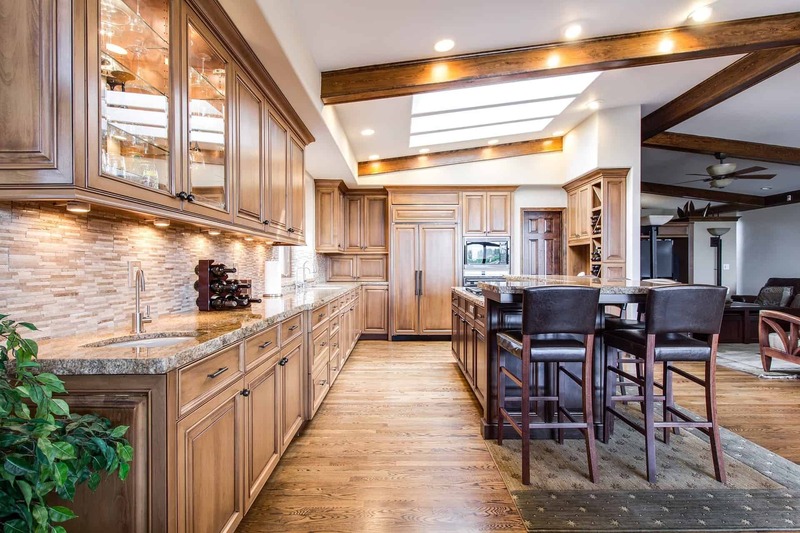 Achieving successful lighting of your kitchen has several important factors, however working with your Las Vegas Contractor to make sure your design has separate dimmers for each layer of lighting will serve to be the key factor in accomplishing this goal. The ability to adjust light levels in the kitchen from a bright illumination for cooking to a soft warm light for conversation over meals will be essential for overall lighting success.